Recently I got a kilo of shearling Romney fleece from Pippajo123 on eBay (recommended!). eBay can be a gamble when it comes to fiber, but I've been lucky and gotten some great stuff, and this fleece is no exception. Lustrous, long, fine, and a lovely crimp too. 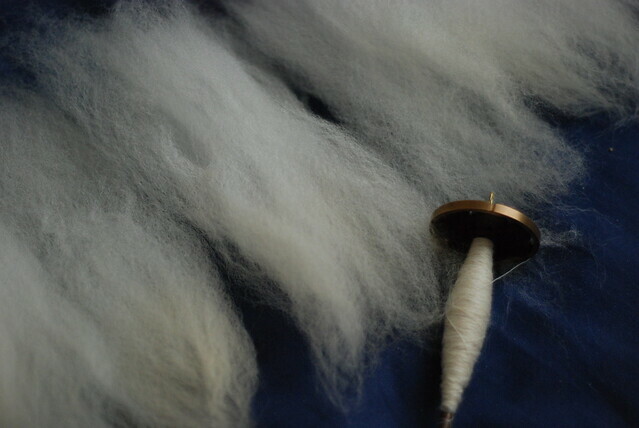 Before this I wouldn't have described longwools as 'versatile' - but I'm spinning this fleece in three different ways. 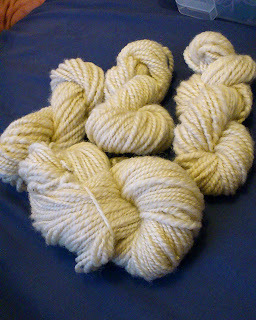 The majority of the fleece is getting spun worsted style into a DK/light worsted 2-ply yarn, tightly plied. This yarn has the best of both worlds - luster and bounce. I'm hoping I will end up with enough yardage for a vest (I will probably dye the yarn before knitting). I've knit up a tiny swatch and I really like the fabric it's making. Next, I took some dark grey mohair and blended it into the Romney, and I'm spinning this (chain-ply on the fly) into some sock yarn. The mohair and wool don't draft together evenly, so this will actually knit up stripey as well as heathery. Finally, I've given some locks the individual hand washing treatment and flicked them out into beautiful smooth handfuls. I'm spinning this finely into a gorgeous lace yarn. I haven't finished it yet, but I'm really excited about it. Basically, this fleece can do no wrong as far as I'm concerned. I wasn't even sure if I was going to love it, when I made the purchase - I mostly favor the springy bouncy wools. But this stuff is just divine. It definitely warrants a different kind of spinning than a downs breed - namely All Worsted, All the Time. I did spin up a little sample in a more woolen draw... It just took all the magic out of the yarn. It definitely wasn't what this wool wanted to be. So, I obeyed the wool, and am spinning it all strictly worsted to bring out the gorgeous pearly shine of these locks. Looks like some really nice yarns are coming out of that, and I'm amazed you can get so much out of one kilo! If it were a kilo of processed fiber or yarn, I would be able to get 2 sweaters out of that (and I'm not a small girl :). A kilo of fleece, there's going to be waste and loss that comes with processing - the lanolin and other gunk that washes out, short bits that shouldn't go into the final yarn, and so forth. This fleece is good because it doesn't have a lot of short bits and it's been skirted well, so I'm able to use most of it.